These Simple Easy Homemade Italian S Cookies are one of my favorite Italian cookies to make and eat. Let me show you how quickly they come together. I guarantee they’ll easily become a staple in your household. If you are familiar with my blog, you know that I like simple, tasty and uncomplicated Italian cookie recipes. I’ve already shared a few of my favorites like these Italian Lemon Cookies or these Anise Biscotti. Today, I will share another favorite of mine…S Cookies! WHAT DO I NEED TO MAKE S COOKIES? Baking Powder. Just the right amount to provide the perfect rise without any aftertaste. Sugar. Just a little bit of sweetness. Olive Oil. That’s right, a no butter recipe and it still tastes great! Vanilla Extract. If available, white. Lemon Zest. Make sure to use organic lemons. We will also brush these simple biscuits with an egg wash and a sprinkle of turbinado sugar before baking them. As far as accessories are concerned, a large mixing bowl and a whisk will ensure the dry ingredients are properly combined. You will also need a baking sheet lined with parchment paper (or equivalent); a medium sized cookie scoop, and a pastry brush for the egg wash.
You can make these no butter cookies in a stand mixture, with a handheld mixer or with a whisk and a bowl -whatever is more convenient for you. In a medium sized bowl, sift together your flour, baking powder and salt. Set aside, while we start whisking the eggs. In the bowl of a stand mixer, whisk the eggs until light and frothy. Slowly add the sugar and continue to whisk until slightly thickened (about 3-4 minutes). Add the oil, vanilla extract, as well as the grated lemon zest and whisk to combine. Add the dry ingredients and combine with a large mixing spoon. Mix only until combined. You are now ready to shape your cookies. Scoop out the dough with medium sized cookie scoop and drop on a lightly floured surface. The dough will be slightly sticky. Roll out each piece in a 4-5 inch strand about 1/2 inch in diameter. Transfer to parchment-lined cookie sheet with a spatula and form into an S shape (or whatever shape you like!) by making small indentations (Make sure to watch the video in the recipe card to see exactly how I shape these traditional Italian cookies). Once all your cookies have been formed, brush the tops with the egg yolk mixture. The sprinkle of sugar is optional. Bake in a preheated oven (350℉) for about 15 minutes or until bottoms are lightly browned. This is a very pale looking cookie. In order to give it a little color, I will switch to broil during the last minute of baking (the tops will become slightly golden in color). Transfer cookies to wire rack to cool completely before storing. And there you have it, 24 perfectly shaped S cookies. A light tasting olive oil will contribute to the best overall flavor, however feel free to use a vegetable or canola oil. If you prefer to have a “thicker” looking cookie, make the strands shorter (4 inch) and make smaller tighter curves; if you prefer to have a thinner looking S shape, make them longer (5 inch strand). Once the dry ingredients are combined, do not over-mix. As a variation, cookies can be dusted with cinnamon sugar, green or red sprinkles before baking, transforming them into Italian Christmas cookies. If desired, once the cookies have cooled down, a very simple icing sugar glaze can be applied (in this variation, I omit the egg wash step). Cookies can be stored in an airtight container for 7-10 days or frozen. 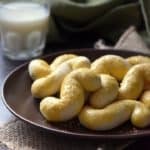 Can I use anise extract in these cookies? Yes! In fact, some families refer to them as Italian anise cookies. Simply replace the vanilla with anise extract. Can I add sprinkles? Yes! Eliminate the egg wash step. When these Italian biscuits come out of the oven, and are at room temperature, simply spread a glaze (combine icing sugar and milk) and top with sprinkles. You now have Italian sprinkle cookies! I have been “hoarding” recipes for many, many decades and so I have a nice collection of recipe books. But the recipes I truly value are the ones I obtained as a result of cookie swapping activities with friends and co-workers. I was first introduced to this recipe about 30 years ago, by a colleague of mine, Anna. Anna would shape her cookies in rings. I like to shape these cookies in a S shape. If you like, you can also shape them into mini sized twists (just like these Lemon Ricotta Cheese Cookies di Chef Luca). Or, you can just leave them as logs. This is a soft and pliable dough, that can be shaped in a variety of ways. Anyway you shape this easy recipe (sometimes referred to as Sicilian S cookies), they taste great with a cup of coffee, tea or even a tall cool glass of milk, making it the perfect snack or Italian breakfast cookie. ★★★★★ If you have made this recipe for S cookies, I would love to hear about it in the comments below and be sure to rate the recipe! Anyway you shape this recipe for these Simple Easy Homemade Italian S Cookies, they taste great with a cup of coffee, tea or even a tall cool glass of milk. In a large bowl of a stand mixer fitted with the whisk attachment, whisk the eggs on medium-high speed until nice and frothy (about 3-4 minutes). Slowly add sugar. Continue to whisk until well combined and slightly thickened (about 2 minutes). Add the oil, extract, and the zest. Combine well. Add the sifted dry ingredients and mix with wooden spoon until well combined, dough will be soft. Scoop dough with medium sized cookie scoop and drop on a lightly floured surface (approximately 2 tablespoon or 25 grams). Place on parchment-lined cookie sheet and form into an S shape. Brush tops of cookies with egg yolk mixture. Bake for 15-17 minutes or until bottoms are lightly browned (this is a pale cookie). OPTIONAL: During last minute of baking switch to broil (the tops will become slightly golden in color). If you prefer, feel free to whisk the batter manually. I made your S cookies yesterday. I followed the recipe exactly, except I used Wesson vegetable oil. The dough was very soft. I added a little more flour, but I had a hard time getting the dough to shape a S like you did. Yours look perfect. Mine kept geting out of shape when I got it over to the cookie sheet and tried to make the S. I ended up making twists instead, I had a hard time with them also. The cookies are very good. I’ve been baking for quite a few years (I’m 83). I can’t understand why they didn’t come out like yours. Do you have any ideas? Hi Toni, I’m sorry to hear you had a hard time with the dough. Nine times out of ten, the culprit is usually the amount of flour. I think you were right to add a little bit more flour… It probably needed another tablespoon or so to get to the right consistency to roll them out. Unfortunately, there is a lot a variation when scooping out dough…if you have a scale, that will provide you with a precise amount of flour. What I can also suggest is once you roll out the dough into a log, place it on the baking sheet and then shape it into the S shape… that way, you don’t have to transfer the dough over. Thanks so much for taking the time to comment, appreciate it! My mom was best baker in the world and of course in her day they used lard I think….but your cookies to me brought me back. Great cookie…not too sweet. Congratulations. Thank you so much for your kind words Rose. I am so happy to hear you enjoyed these S cookies. Yes, my guess would also be the use of lard back then. Appreciate you taking the time to share, thanks again. Forgot to ask, are olive oil and vegetable oil interchangeable? Do you use light olive oil or extra virgin olive oil? You can taste the difference between both oils, it really depends on your preference… I like the fruity flavor of the olive oil. I will usually grab the light olive oil… sometimes I just grab whichever bottle is closer to me 😉 Great questions! Thanks Mita. I had to smile when I read you have been hoarding recipes for a while. That is what I do too. I have printed and saved so many recipes that now I don’t even remember what I have printed over the years. They were so good. I will try with butter and maybe a little orange juice. Thank you. Love these cookies. I just made them this past Thursday and I have some in the freezer because I doubled the recipe. How wonderful Judith! These S cookies are a family favorite. I also freeze them so that I don’t eat too many at a time. Unfortunately, that doesn’t stop me… lol. Appreciate you taking the time to share your experience with this recipe. Hope you are having a wonderful day! Thank you so much for this recipe- loved it. Quick question- I used wholemeal self raising flour instead of plain flour and I found my cookies were dry and soft, still good for dunking. Please let me know how may I improve it next time I bake a batch. If I understand correctly, “wholemeal self raising flour” is a whole wheat flour that includes a concentrated form of baking powder and salt. As a result, these two ingredients must be eliminated from the recipe. I am assuming that you did not include the baking powder and the salt as indicated in the recipe as this would definitively result in weird tasting cookies. If in fact “wholemeal” is a whole wheat flour, this might contribute to the dry texture. I would try increasing the liquid in the recipe… perhaps 1-2 tablespoons of milk. You could also try decreasing the total amount of wheat flour used, maybe a couple of tablespoons to start with… and see what effect that has. But keep in mind that you will be altering the amount of baking powder, so that can affect the overall quality of the cookie. Not sure if that helps. Feel free to get back to me with any other questions or concerns. Would love to hear about your results if you do decide to try it again. I used to buy S cookies from a bakery in the North End Boston and they stopped carrying them. I couldn’t find any as good so I made your recipe, without the egg wash. Delicious! The cookies were great and easy recipe to follow. Thank you! Question. Your salt measurement is a bit confusing. You said a pinch teaspoon. A pinch and a teaspoon are very different. I put 1/2 teaspoon. Can you please clarify. Thank you. Thanks Maria for the clarification. 1/2 tsp resulted them being a bit salty. However, I’ve tried other S cookie recipes and yours are the best! I also sub avocado oil for the olive oil. Do you use extra virgin olive oil or light olive oil? It really is a question of personal taste… either one work well in the recipe. Appreciate your comment, thanks! You know that I love simple flavors and ingredients, like you, so these cookies are perfect for my taste buds! They look adorable and vanilla and lemon are the perfect pair. The Italian stores sell a lot of S cookies but you can’t beat the homemade ones! Look so good and just as I remember them.